Pour 1 Tbsp. (or 2) of olive oil in a large pot. Place over medium heat. Add 1 onion- cut in large chunks, a couple of stalks of celery- cut in half and a couple of whole carrots- cut in half. Stir around with wooden spoon for a few minutes. Add 2 pounds of raw chicken tenderloins (or sliced hunks of chicken breasts). Sprinkle wit h salt and pepper. Let the chicken brown for a few minutes. Then add 8-10 cups of water- or whatever fits in your pot. Simmer until chicken is cooked through (about 10 minutes). Take off stove. Remove and discard vegetables and pull out chicken. In the pot, drizzle a little olive oil- over medium heat. Add 2 lbs of cooked torn (or diced) chicken (if you are tearing immediately after cooking be careful it’s hot!) You can use rotisserie chicken if you want. Stir and incorporate all ingredients together. Add the broth (10 cups of broth) If you make your own and it doesn’t make enough- add a can of chicken broth or more water. Let it cook for 10 minutes or until veggies and noodles are soft. Season with salt and pepper to taste. Garnish with fresh parsley or other herbs if you like. If you are making this in two stages, like I do, I do Stage 1 ahead of time (like before work or the night before) and chop the carrots, onions and celery while the broth and chicken are cooking. I put them in the refrigerator, along with the cooked chicken and broth for after work. I pull everything out and do Stage 2 when I get home. Then the soup is fresh (noodles not soggy) but half the work is done. Serve immediately with a hunk of crusty bread. Many of the soups that I make start with sautéd onions and garlic. This, my friends, is called a mirepoix. **The food word of the day is mirepoix (pronounced “meer-pwah”). It is the chopped carrot, onion, celery combination sautéed to start the soup. It is commonly used as a base in soups, stews and other dishes. These three ingredients are commonly referred to as aromatics. Other ethnicities have variations on this: Cajun and Creole have “holy trinity” which includes onion, celery and bell pepper; there is Italian “soffritto” which includes onions, garlic, tomato; and French “duxelles” is made of onions, shallots, and mushrooms. One is The BIG Book of Words you Should Know (by Olsen, Bevilacqua, and Cord Hayes). It is chock full of words categorized for fun-filled word learning. And you might want to take a listen to this NPR piece about the proper turn of phrase in an interview with the author of The Elements of Eloquence. Also, a fun podcast that my friend, Elaine, turned me onto about words and language is “A Way With Words”. This classic chicken noodle soup hits the spot when you want a simple, savory, warm meal. As always, tweak as you like- add more vegetables, use rice instead of noodles, try different spices. 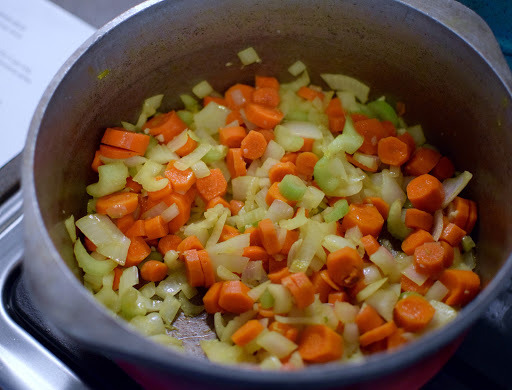 Just don’t skip the mirepoix!